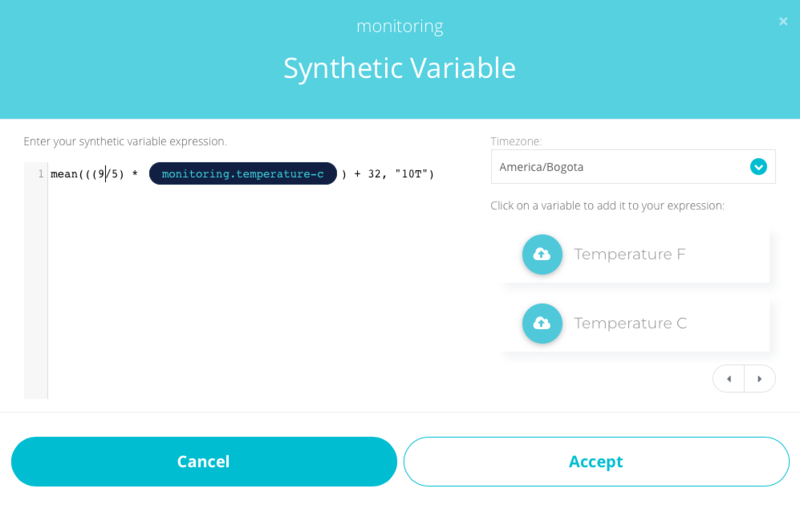 Ubidots Analytics Engine supports a complex mathematical computation tool called Synthetic Variables. Simply, a variable is any raw or computed data within a device in Ubidots. A "Synthetic Variable" is a variable that results from the computation of other variables within Ubidots. This tool is very useful to extend your application's functionality, i.e if you develop a temperature logger that reads the variable in °C and you wish to show the data in both °C and °F you would retrieve the sensor change and to send two values to Ubidots: one value in °C and other one in °F. This adds an additional (and unnecessary) compute load to your microcontroller. Using the Ubidots' Analytics Engine you need only send the raw value in °C, and let Ubidots perform the required calculations to convert to ºF, alleviating the excess microcontroller processing requirements. In this article you will learn the basics about Synthetic Variables and the available mathematical and statistical functions you can implement using this tool. With Ubidots' Analytics Engine, you can apply different operations to the time-series data-set to create an adjacent data-set containing computed variables; these new variables are called Synthetic Variables. To create one, simply click on the "Add new variable" option within your device, then select "Synthetic". CLICK HERE for a PDF containing the complete listing of Ubidots Functions. ceil(x) : Returns the ceiling of x as an integer, the smallest integer value greater than or equal to x.
floor(x) : Returns the floor of x as an integer, the largest integer value less than or equal to x.
tan(x) : Returns the tangent of x radians. cos(x) : Returns the cosine of x radians. sin(x) : Returns the sine of x radians. log(x, base) : Returns the logarithm of x in the specified base (by default base = Euler number). sqrt(x) : Returns the square root of x.
abs(x) : Returns the absolute value of x.
round(x, n digits) : Returns the floating point value number rounded to "n" digits after the decimal point. max(x, data_range) : Calculates the maximum value of the variable in the specified data range. min(x, data_range) : Calculates the minimum value of the variable in the specified data range. mean(x, data_range): Calculates the mean value of the variable in the specified data range. count(x, data_range): Calculates the number of dots received stored in the variable time-series in the specified data range. last(x, data_range) : Returns the last value of the time-series in the specified data_range. sum(x, data_range) : Returns the summation of the dots in the specified data_range. The above example corresponds to the sum of raw_variable computed every 8 hours, offset by 6 hours (beyond 00:00:00), that is, 06:00:00. Accordingly, your synthetic variable will be run at 6:00, 14:00, and 22:00 daily. where(condition, operation) : Performs the operation if the condition is True. fill_missing(x) : Will enter the last value of a variable when an expression requires data from a timestamp that does not match the other timestamps within the expression. this dot, '.' , operator lets you access and represents the variable's timestamp. Computes an expression containing multiple variables with different timestamps, filling any non-equal timestamped values with the non-equal variable´s last value. The synthetic variables editor allows you to select the timezone to reference the exact variable's timestamps based on a particular timezone. This come in handy when, for example, working with Data Range Functions to calculate a min or max in a day. If your clients are in California but you're assembling the App in Georgia, this timezone in the Synthetic Variable will utilize the correct data based on the timezone selected. 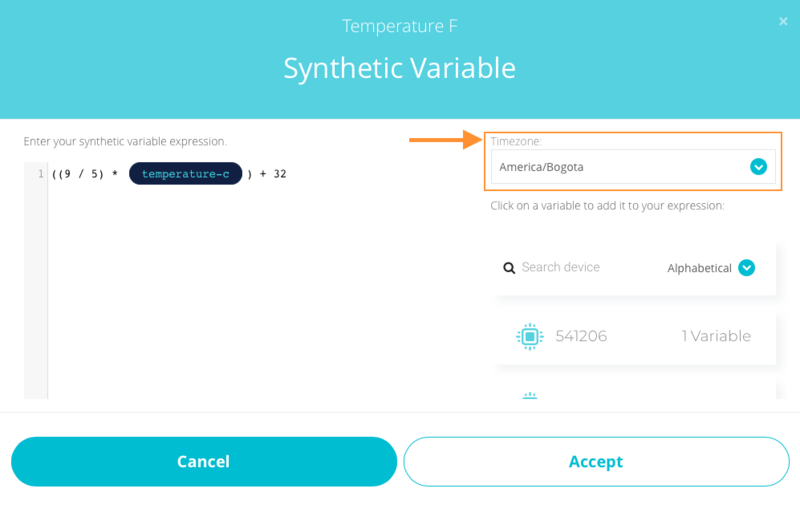 After clicking the "Accept" button, the Synthetic Variable will calculate data as if from the timezone selected and the expression and results will be automatically saved in the history trails of the variable. Now you're ready to start creating analytics and insights from your data using Ubidots' Analytics Engine and the Synthetic Variables. For additional troubleshoot and inquires, check out the Ubidots Community for assistance from not only Ubidots but also your fellow users who may experience your same errors.